This manuscript is typical of the sort of book owned by medieval university students: its contents are academic, it is small and easily portable, the text is written in small cursive script, and with minimal decoration. On a flyleaf is a partially erased inscription, recording that it was given by a university graduate to an Oxford school; a later medieval inscription records its ownership by Holy Trinity collegiate church at Tattershall, in Lincolnshire. 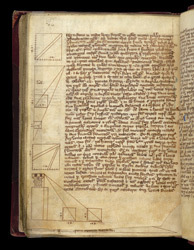 These diagrams illustrate the text in a treatise on Mensuration (a branch of geometry that deals with the measurement of lengths, areas, and volumes) and elementary trigonometry, all involving squares whose sides are 12 units long.